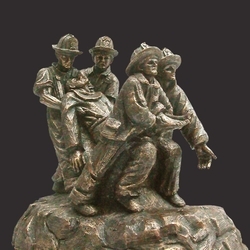 First From The Flames by Timothy P. Schamlz is a wonderful Christian sculpture that reminds us of the dedication and fearlessness of our first responders. Four fire fighters recover New York City Fire Chaplain Mychal Judge From the Flames of the 9/11 disaster. “I can only say that your beautiful sculpture “First From The Flames” moved me to tears. It is so powerful! Timothy, I truly believe that God guides your hands to create such moving works of art. Thank you and God Bless.” Meg Judge. This solid resin-stone cast is coated in a realistic bronze finish and is mounted on a solid rock-style base in the same finish. Timothy personally sculpts every original small masterpiece complete with his signature or monogram. Each replica is detailed by hand to the exacting standards of this modern day master sculptor.